Thomas Gould was born on 31 July 1841 in Sheffield, the son of Thomas Gould 1802-1869 and his wife née Frances Maria Brookfield 1805-1888. He followed in his father's footsteps, becoming a solicitor and eventually taking over his law practice at 4 Paradise Square in Sheffield. The firm had been founded in 1787 as Brookfield & Gould, afterwards becoming Gould and Coombe, and later Gould and Newcombe. On 13 May 1869 he married Frances Harriet Sharpe, eldest daughter of the late Captain John Edward Sharpe of the 46th Bengal Native Infantry, at Trinity Church, Milton near Gravesend (1). She was born in Lahore, India in 1850. In 1871 they were living at Victoria Road, Ecclesall in Sheffield, but had moved to Endcliffe Crescent in Sheffield by 1881. In 1891, Frances Harriet Gould was living with three of her children at 25 St. Mary's Road, Kensington in London, possibly while they were being educated there. Her husband Thomas Gould meanwhile stayed in Sheffield. Alexander Cyril Gould. He was born on 13 May 1870 and baptised at Sheffield Cathedral on 1 July 1870. He was educated at Repton School (3). In 1895 he married Beatrice Grace M. Cooke (born in 1875 at Notting Hill in London) at Lewisham in London. They had three sons: Aubrey R. Gould (born in 1896), Eric C.S. Gould (born in 1898) and Dudley N. Gould (born in 1901). They lived in Bayswater, London. Alexander Cyril Gould died in 1942 at Hendon in London aged 71 years. Florence Evelyn Gould. She was born on 5 November 1871, and baptised on 16 January 1872 at Sheffield Cathedral. Lionel Aubrey Gould. He was born on 10 October 1873, and baptised on 21 November 1873 at Sheffield Cathedral. He was educated at Repton School (4) where in 1891 his housemaster was his uncle the Reverend John Gould 1849-1920. Ralph Colin Gould 1877-1923. He became a solicitor, and went to Malaya. In 1891, Frances Harriet Gould was living with three of her children at Kensington in London, possibly while they were being educated there. Her husband Thomas Gould meanwhile lodged in Sheffield. She died in Yorkshire in 1898 aged 49. In 1900, among the firm’s archives Thomas Gould made a discovery which caused a literary sensation. In an ancient box that had been lying in the office for over sixty years he found a packet of old correspondence, "sallow scraps of manuscript". They proved to be letters dated 1833 to his uncle the Reverend William Henry Brookfield from Tennyson and Arthur Hallam, his friends from student years at Cambridge. With them were manuscripts of previously unknown early versions of Tennyson's poems The Lotus Eaters and The Lady of Shallot. 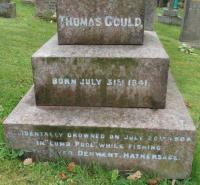 Thomas Gould died on 20 July 1908 at Hathersage in Derbyshire (5). He was accidentally drowned while fishing in the river Derwent in Derbyshire (6). His body was found in the Lumb Pool at Bamford in Derbyshire (7). He was buried at Hathersage, where there is a gravestone inscribed to his memory. (1) The Sheffield & Rotherham Independent newspaper Saturday 15 May 1869 page 8 issue 4942. (2) Notice of the birth of a son born on 13 May 1870 was placed in The Sheffield & Rotherham Independent newspaper Saturday 21 May 1870 page 12 issue 5267. He would appear not to be Alexander Cyril Gould (born 1871) and is not recorded in the 1881 and 1891 Census Returns. Unfortunately the family do not seem to be recorded in the 1871 Census. (3) Repton School Register: Supplement to 1910 Edition edited by M. Messiter (1922) page 116. (4) Repton School Register : Supplement to 1910 Edition : January 1885 to April 1887 page 137. (5) Probate Calendar page 288. (6) "Mr Thomas Gould senior member of the firm of Gould & Coombe, of Sheffield, was found drowned in the River Derwent at Hathersage last Saturday. He left his office the previous Monday with the intention of fishing in the river and nothing was heard of him until Saturday night when his body was found by another angler. He had evidently been wading, and it is thought he stumbled into a deep pool. Mr Gould, who was about 65 years old was admitted as a solicitor in 1864, and was an ex president of the Sheffield Law Society. He was a brother to Mr Charles Gould K.C" The Law Journal 1 August 1 1908; "DEATH – On July 20, Thomas Gould of 4 Paradise Square, Sheffield. Solicitor aged 67 years, (Father of Ralph Colin Gould, Solicitor Penang), accidentally drowned while fishing in the Derwent. It is understood that whilst wading he went beyond a ledge and drowned the deep water." Straits Times of Singapore 24 August 1908. 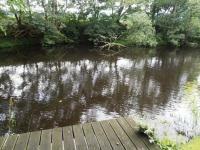 (7) The Lumb Pool is behind Bamford Mill which is now a development of luxury apartments.